Must have been an active SASS member for a minimum of 3 consecutive years. Must belong to and be an active member of at least one SASS Affiliated Club. Must be current RO I & RO II Certified, with a refresher course having been completed in the last 2 years- with a requirement of a bi-annual refresher course. Computer savvy with a current email address on file at all times. 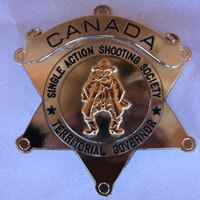 SASS Territorial Governors are committed to serving the interests of his or her club consistent with the promulgation and preservation of Cowboy Action Shooting and "the Spirit of the Game" and serves as his or her affiliated clubs' official representative at SASS Territorial Governor meetings. Territorial Governor is the elected/appointed representative of his or her SASS affiliated club. The Territorial Governor's term of office expires each December 31st. There is no limit to the number of terms one individual may serve. The SASS Board of Directors recognizes the Territorial Governors must be in a position of more than mere advisors for this vision to work. While the SASS Administrative Office and the SASS Corporate Officers have their roles and responsibilities and are chartered with making the decisions necessary to run the company, those issues, policies, and decisions that directly impact the rules of the Cowboy Action Shooting? game will be voted upon by the Territorial Governors. Questions and issues may originate anywhere, but once they are forwarded to SASS Headquarters, the SASS national organization will frame the questions for the Governors, collect the Governor responses, and construct the proposed revised rules or policies. These proposed revisions will then be reviewed and approved by the Governors. While many of the Territorial Governor votes will be at the national and regional match meetings chaired by the Wild Bunch, the Territorial Bulletin will generally be used to set the agendas and often used to distribute voting issues. Instructions will be provided in the Bulletin describing the response process.